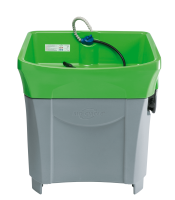 The BIO-CIRCLE GT Compact is a parts washer system with a compact design. Its easy handling and the fast, safe and eco-friendly cleaning also of strongly contaminated parts make it a pro in parts cleaning. 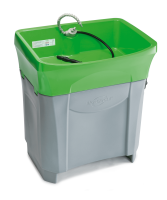 The sturdy plastic (PE) device is recyclable, the VOC-free Liquids have long service lives, and maintenance is easy and unproblematic because the control box contains all technical components (electrics, heating, float switch and temperature sensor). This ensures easy assembly for service, repair and cleaning. 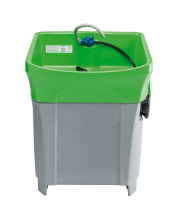 The BIO-CIRCLE GT Compact makes parts cleaning easy and safe. 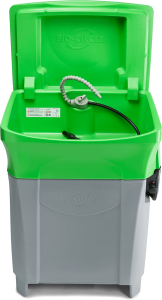 The parts cleaning device meets highest requirements on ease of use, reliability and suitability for daily use. Water-based cleaning with natural microorganisms, without solvents or cold cleaners. The employee and the environment are protected from highly volatile vapours. Oil biodegradation guarantees a long service life. No HAZMAT, no hazardous goods, no fire hazard. BIO-CIRCLE – a long-term solution for convincing parts cleaning on a natural basis. Related links to "BIO-CIRCLE GT Compact"